Here’s a quick reminder that I’m going to be speaking at the Child Care History Network conference next month. It will be held at the Buckerell Lodge Hotel in Exeter on 3 October 2014. Please consider coming along if you’d like to hear more about our Unexplored Riches in Medical History project. It would be great to meet some of you there. The keynote address of the conference will be given by Professor John Stewart from Glasgow Caledonian University. Other speakers include Jeremy Holmes, Sarah Hayes and Annie Skinner, and I’ve just heard that another exciting speaker may be added soon. Click here to see the conference programme and book your place. 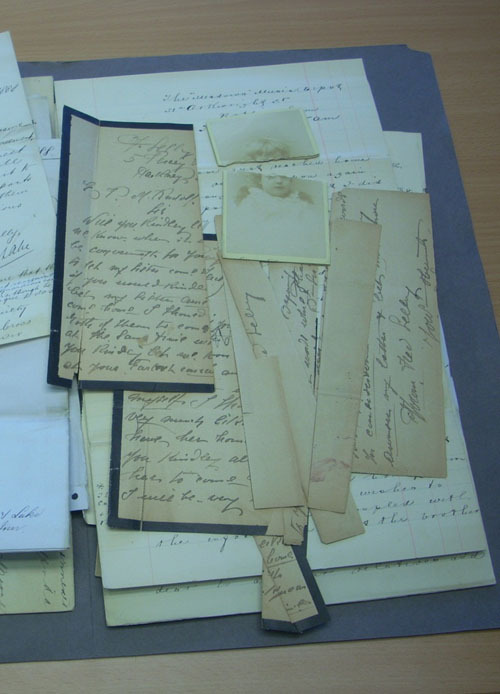 We are pleased to announce that The Children’s Society Records and Archive Centre has obtained a further £42,180 grant from the Wellcome Trust for the ‘Unexplored Riches in Medical History’ project to continue paper conservation work on the earliest children’s case files. The additional money will allow our two professional paper conservators to work for a further eight months to better preserve the files and make them accessible to the public and researchers. The project, including the launch of an online catalogue of case files and children’s homes records, is due to be completed in March 2015. 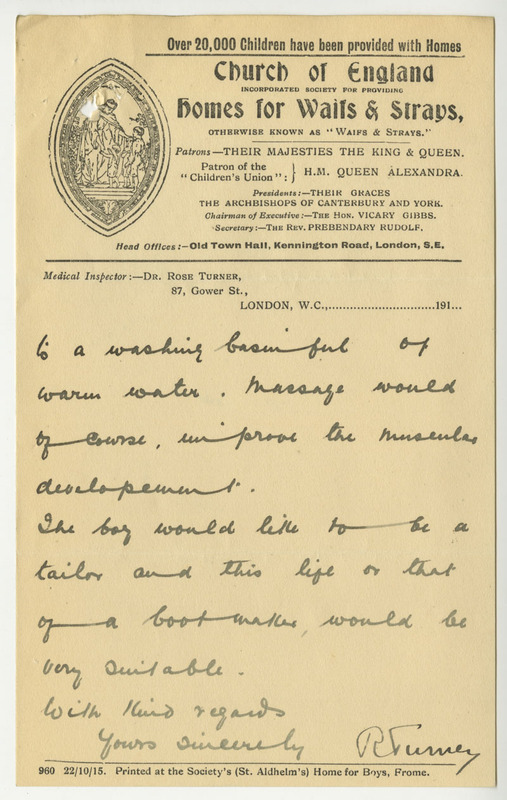 By creating an online archive catalogue and through conservation work, the records will be widely accessible to The Children’s Society, medical, social and academic researchers and the general public. 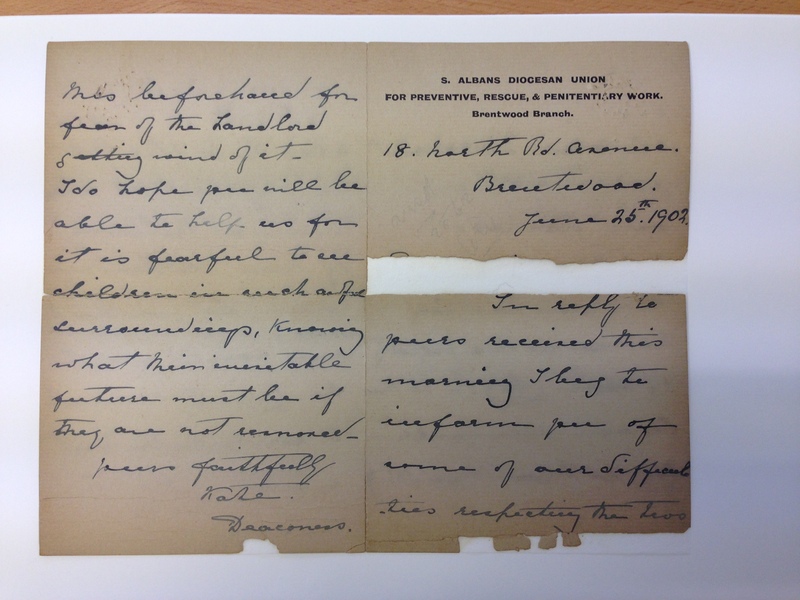 Today, we have a guest post written by one of our Project Conservators, Lianyu Feng. 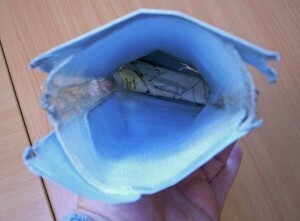 Lining is used to give support to an original paper document or artwork. 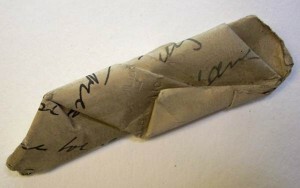 When paper deteriorates, it gradually loses its strength, thus becoming brittle and weaker. 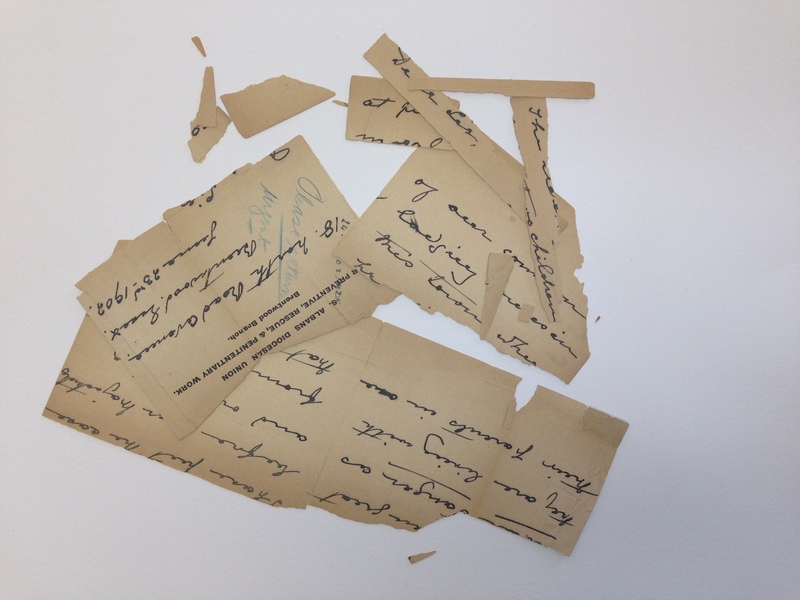 Any unsuitable handling can cause further damage such as tearing, and could even cause the paper to fall to pieces. In our Unexplored Riches in Medical History project, such weak documents cannot be handled or read and so can’t be used for research. In order to repair these torn and fragmented documents and make them usable again, we line them with a supporting material. 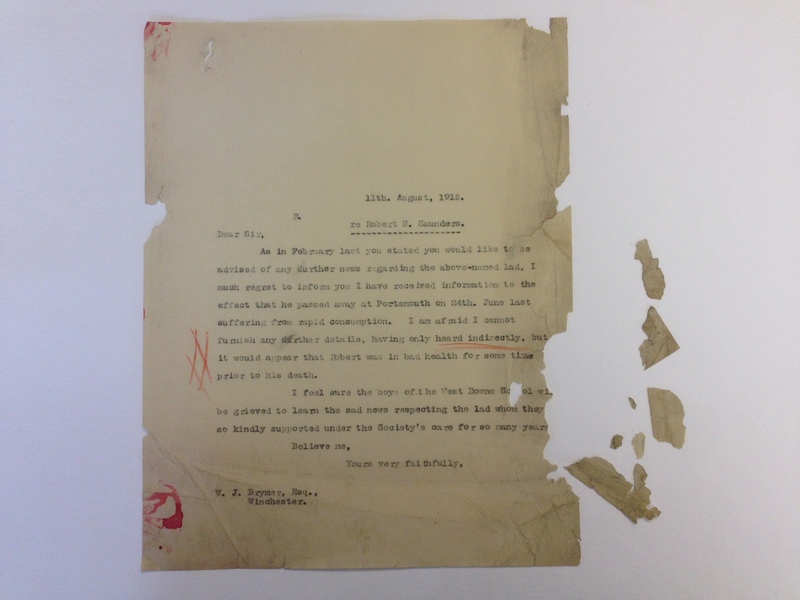 The document below had many small fragments before it was repaired. 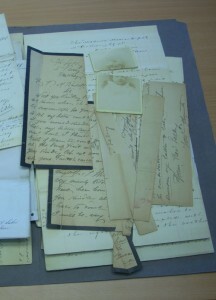 These fragments needed to be re-attached to the document. Lining is a good method to do this in a fast way and give the whole document more support. 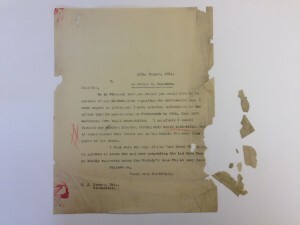 Below is another example showing severe deterioration, which has made the document fall to pieces. It would be impossible for anyone to read this easily. A light box, such as the one below, helps us to place the fragments into the right position. It makes it easy to see where the gaps are, and then we can align the fragments into the exact positions. If the object contains ink which is not sensitive to water, wet lining using Japanese tissue and special conservation adhesive is one of the most common methods. 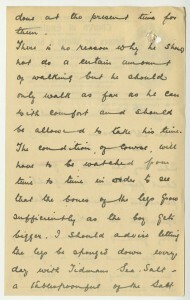 As lining should not obscure the information on the object, the back of the document or the side which contains the least information is the most suitable for lining. 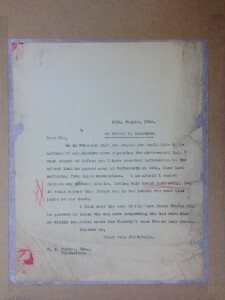 For example, the document below has had Japanese tissue placed on the back of it so as not to obscure the text on the front. When wet lining has been carried out, the document will then need to dry. 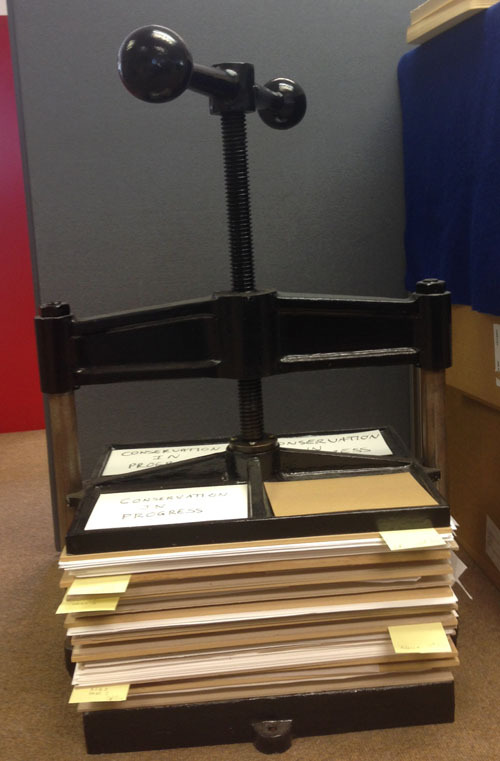 The document is dried under tension; this means that the document stays flat as it dries. This flattens existing creases and prevents new ones from appearing. Once a document has been lined, the object will be stronger, and completely flat, with all the fragments having been re-attached and any tears stabilised. A lined document is both easier to handle and looks better aesthetically. 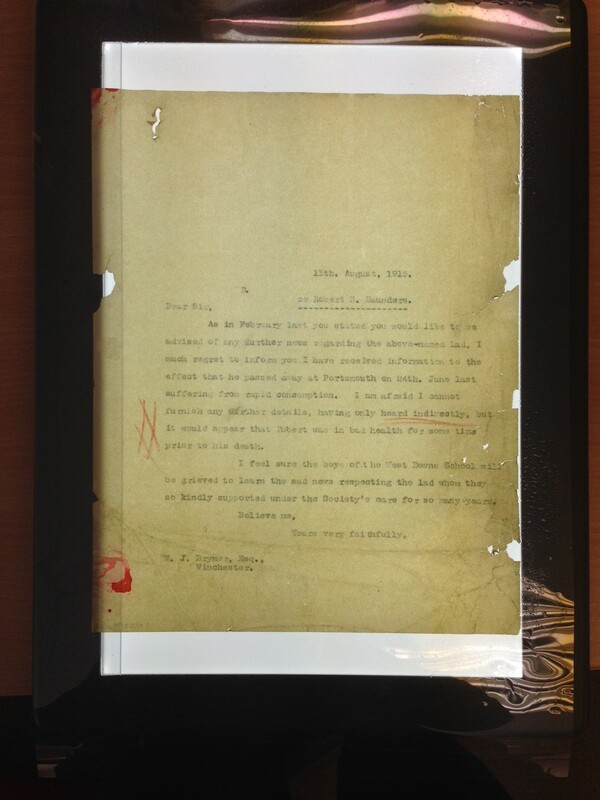 Below, we return to the document we saw earlier, which had completely fallen to pieces. Here it is after lining. All the pieces have been placed in the right position, although unfortunately some parts are still missing, such as the line in the middle. 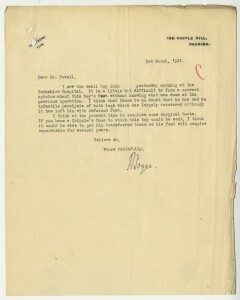 However, we can now handle and read this letter without difficulty. Today I am excited to announce that I will be giving a talk about our Unexplored Riches in Medical History project at this year’s Child Care History Network conference. 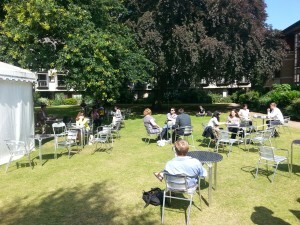 The theme of the 2014 conference will be Healing the Wounds of Childhood – the Medical and Psychological Care of Children: Historical and Current Perspectives, and it will be held at the Buckerell Lodge Hotel in Exeter on 3 October 2014. Click here for the conference website, where you can find the conference programme and details of how to book your place. For my talk I’ll be discussing the Unexplored Riches in Medical History project in more detail. 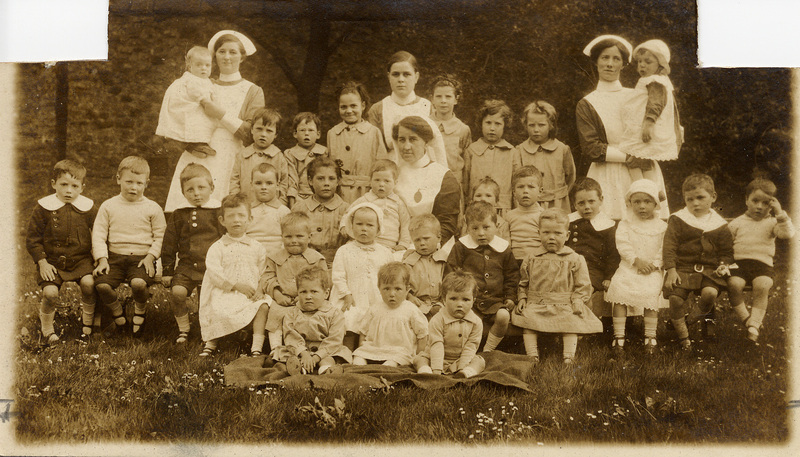 As we’re coming closer to the end of the project, it’ll be a great chance to look at what we’ve achieved so far and what medical information has been unearthed in the archive of The Children’s Society. 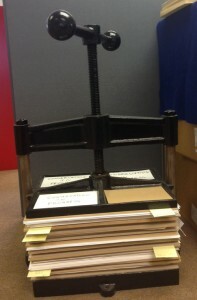 I’m looking forward to sharing some of the great resources and stories we have here in our archive. Alongside myself, there will be speakers covering various aspects of the history of children’s health and healthcare. This includes keynote speaker John Stewart, Emeritus Professor of Health History at Glasgow Caledonian University, who will be talking about the history of child guidance. 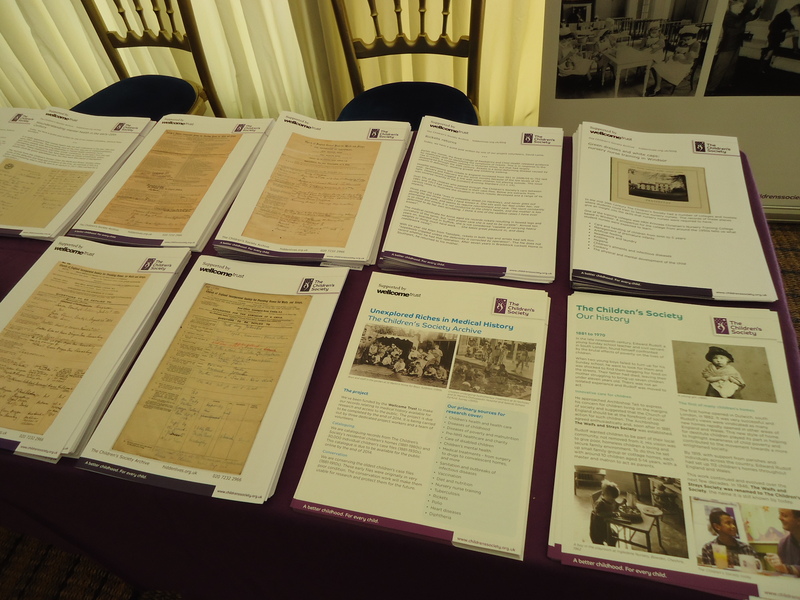 Things are rather busy here at The Children’s Society Archive, as we’ve just returned from attending the Society for the Social History of Medicine’s 2014 conference. The theme for this year’s conference was Disease, Health and the State. 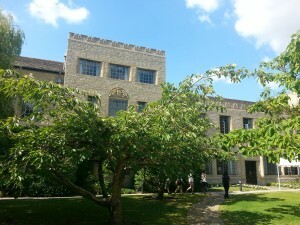 It was held at St Anne’s College in Oxford over three days, and it hosted a multitude of speakers and attendees from across the world, all of whom had an interest in medical history. Myself and the head of The Children’s Society Archive, Ian Wakeling, attended to run a stand in the conference marketplace. 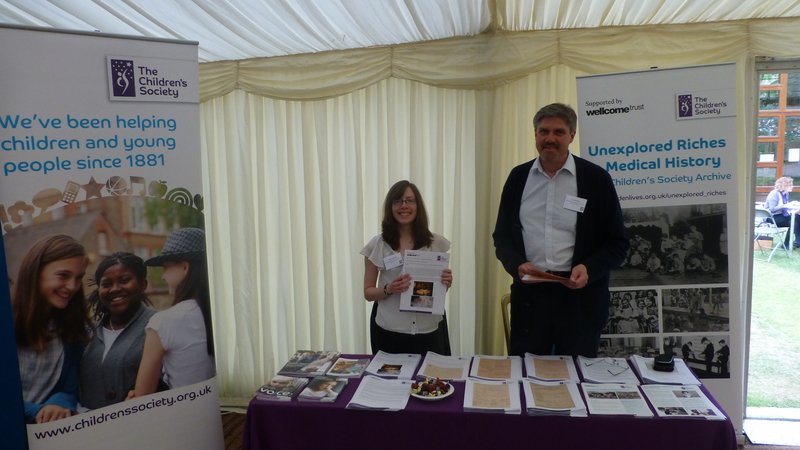 On our stand we had lots of information about the Unexplored Riches in Medical History project, including some facsimile case files and some posts from this blog that I’d printed out. See the stand and a few of our leaflets below. It was my first time running a stand at a conference and I have to say that I really enjoyed it. 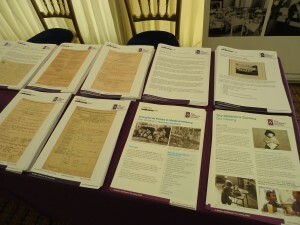 Our aim was to promote The Children’s Society Archive and its wealth of medical information to the conference attendees. This was a big success. 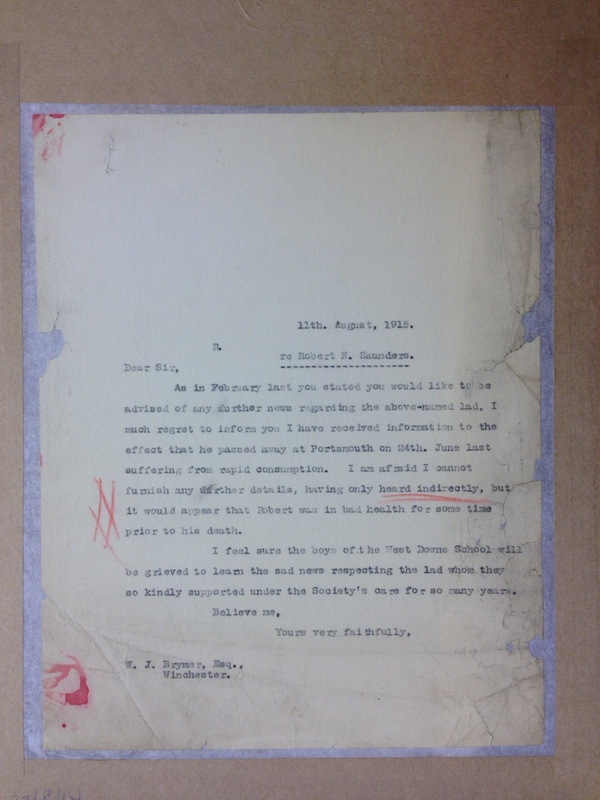 We spoke to a lot of people, most of whom hadn’t heard of The Children’s Society before and certainly wouldn’t have realised how useful our archive is for medical history research. They all seemed to be pleasantly surprised! 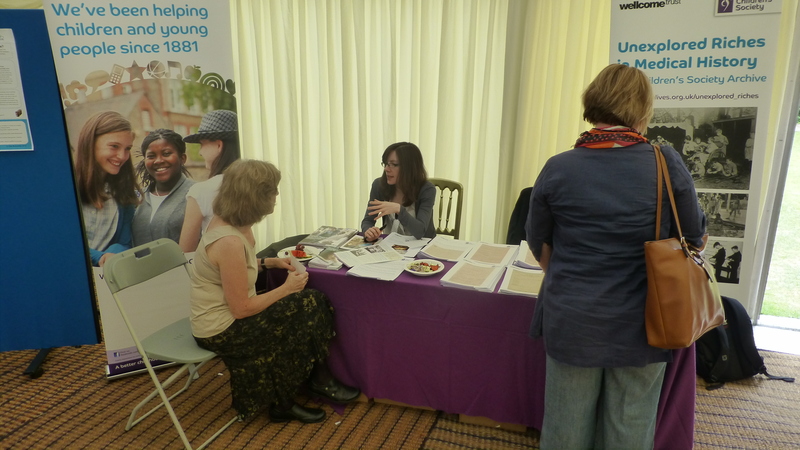 Not only were we able to give out our details to lots of people who were interested in the archive for research (for themselves or for their students, colleagues and friends), but we were also able to discuss people’s research interests, which were fascinating. 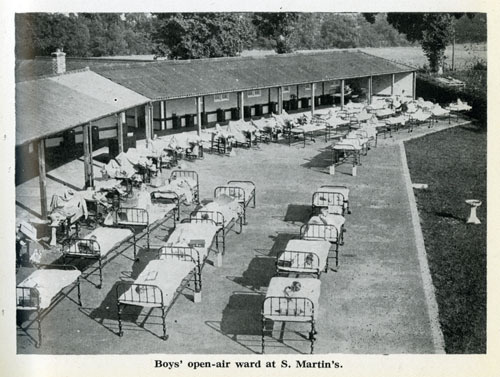 It was really interesting to hear about all the research into medical history that’s going on, and to discuss how The Children’s Society archive collection can help. Not to mention, there were many times where we discussed how The Children’s Society started and how it got to where it is now, including the whole range of records it created during that time, from children’s case files to records from the individual children’s homes. I could go on for a lot longer, but I’ll leave it here to say that Ian and I are both really glad that we went along. 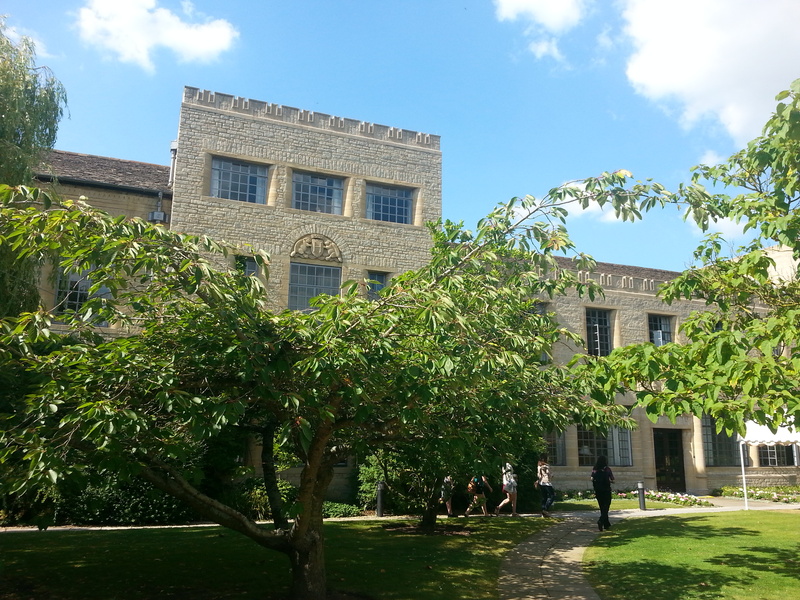 It was great to talk to medical historians about their research and introduce them to an archive that they may never have considered using before. Thanks to the conference organisers for a great event! More information about the conference can be found on the 2014 conference website. Today we have a guest post written by one of our project volunteers, George Cooban. It’s the time of year when lots of us go to the seaside. 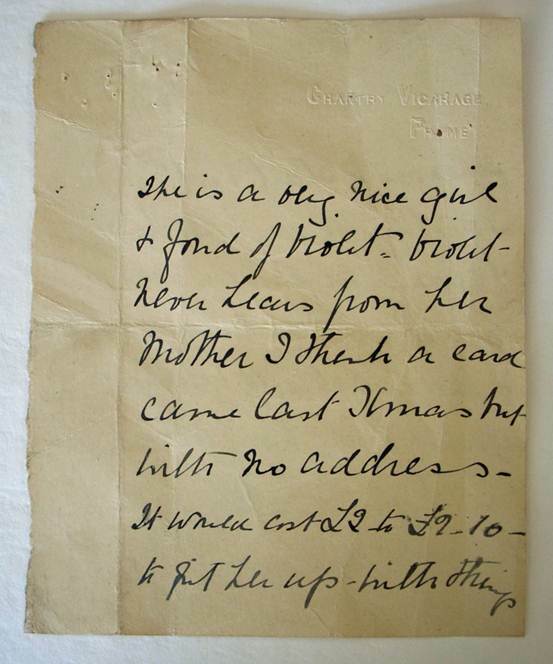 The case files tell us that many of the children in the care of The Children’s Society in the late-19th and early-20th centuries also visited the coast. But, unlike today, it was often for medical reasons, rather than a holiday. Previous posts on this blog have highlighted cases where various health conditions led to children spending time by the sea. 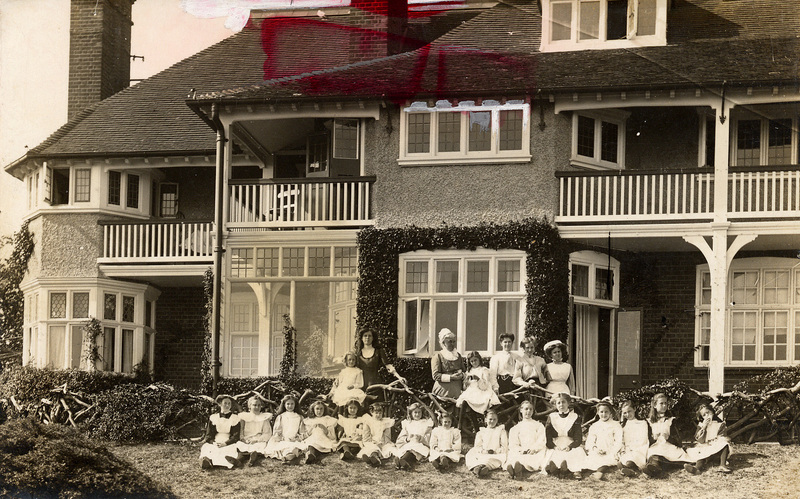 The coastal convalescent homes run by The Children’s Society at Hurstpierpoint and Broadstairs, established to facilitate the care of sick children sent there, have also been researched in detail. However, I was keen to find out what the case files can tell us about the thinking behind this formerly commonplace practice. 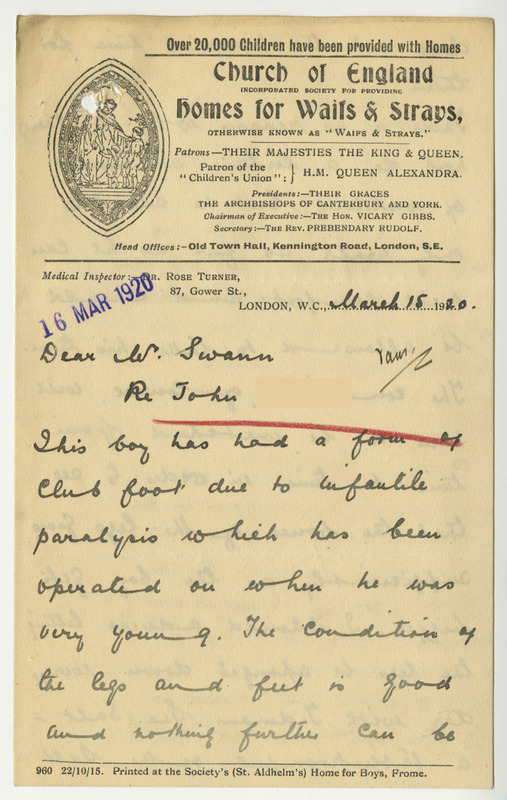 Tuberculosis features very prominently in the case files, and the medical rationale behind the way it was dealt with is often quite clearly recorded. Therefore I decided to focus on cases relating to this condition in this blog post. One thing we notice when examining many of these case files is that seaside convalescent homes were viewed as a means of preventing tuberculosis. (So not all the children who stayed at them were, strictly speaking, convalescent). 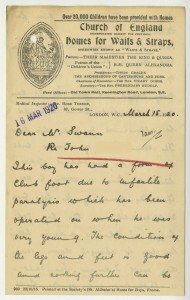 This is illustrated by reports such as this one, dated 19 June 1910. 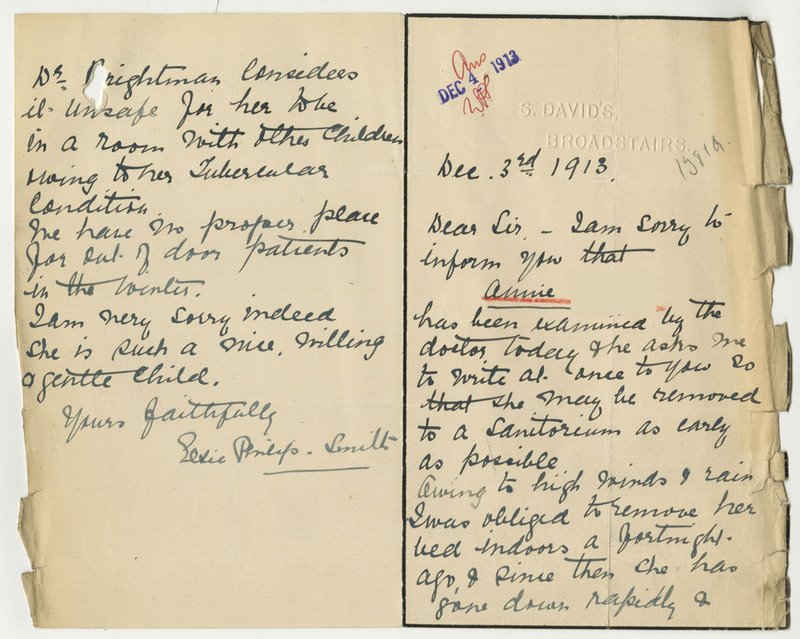 Another case file contains a medical certificate, written on 7 June 1905, which states that a child, a seven year old girl named Dorothy, has “a tendency towards consumption [tuberculosis]” and recommends moving her to the coast. 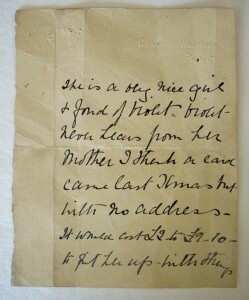 Later correspondence says that she was treated with a special diet including new laid eggs. 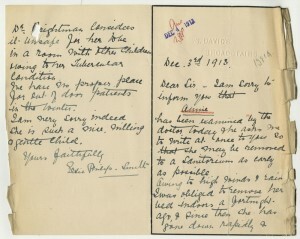 Terms like “delicate” and “a tendency to tuberculosis” appear regularly in the case files. 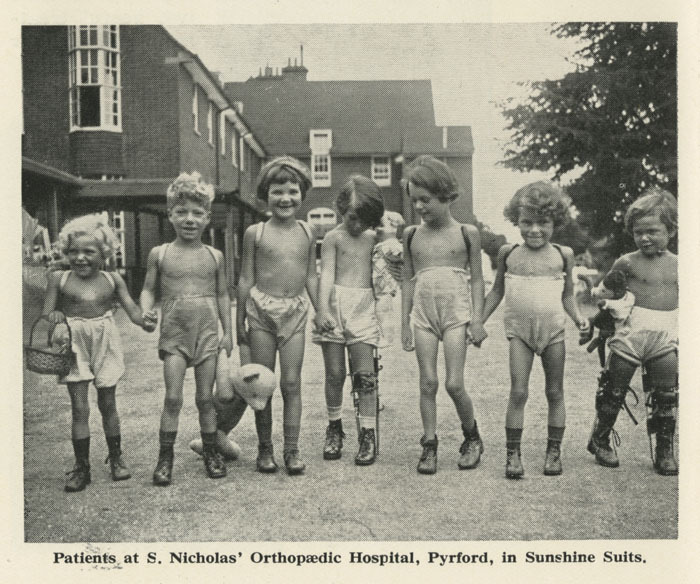 The health of the children referred to in this way was not good, but there is evidence to suggest that sending them to the seaside was seen as a preventative measure, stopping the development of more serious problems. 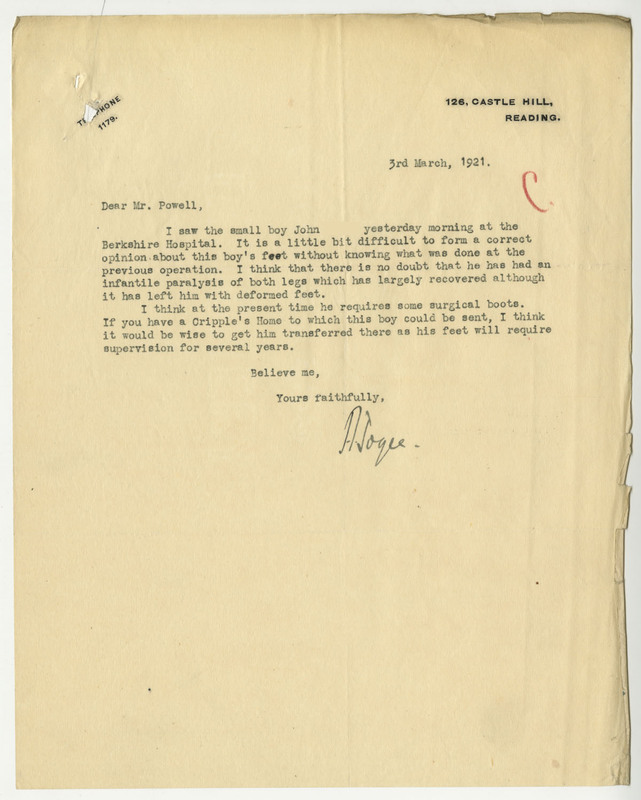 The most surprising thing about this letter is the time of year it was written. It is implied that the only suitable place to treat tuberculosis patients is outdoors, even in winter. 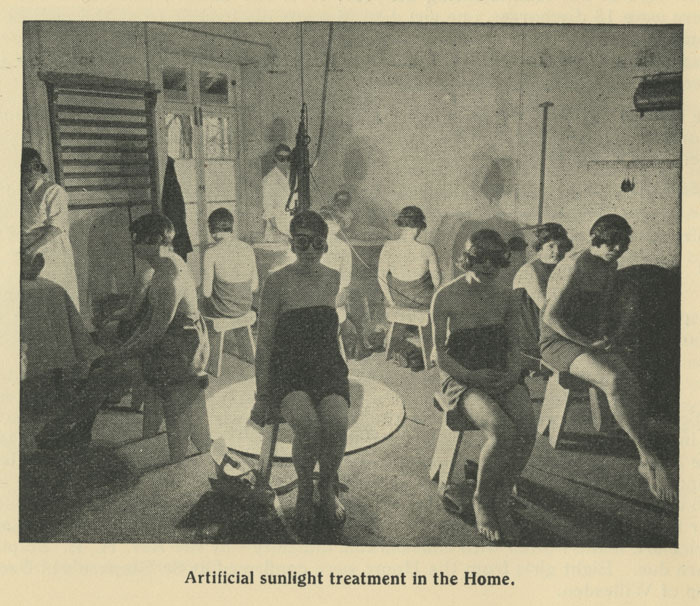 Open-air treatment for conditions including tuberculosis was fairly common a century ago. 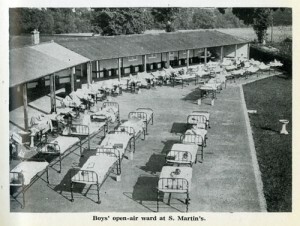 By arranging beds out in the open, as can be seen in the picture from The Children’s Society’s St Martin’s Home in Pyrford below, patients would be exposed to lots of air. 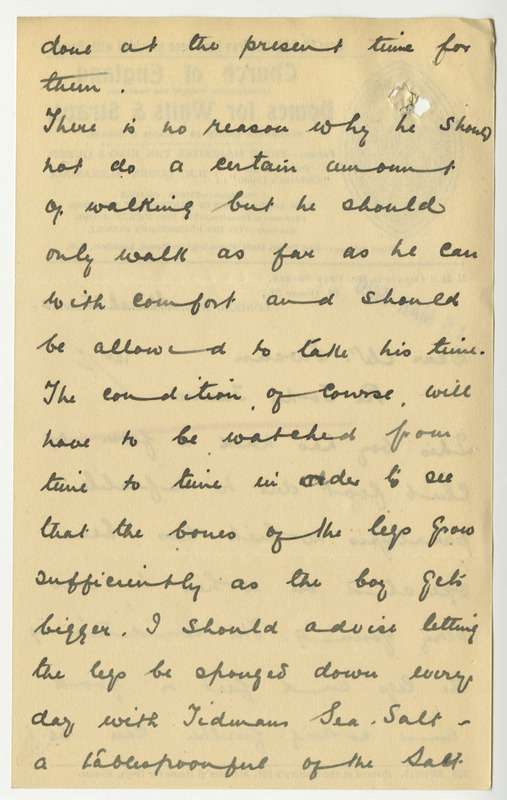 From the letter about Annie we discover that open-air treatment was practiced all year-round. The need for weather which allowed it to take place is also evident. It can be said, in fact, that the weather conditions were of greater importance than how close the patients were to the sea. This is certainly suggested by a letter from another case file. 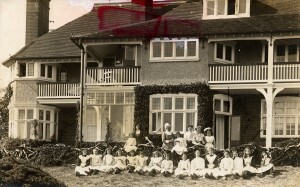 A doctor writing in 1909 advises that a girl “threatened with phthisis [tuberculosis]… would be much benefited by removal to a warmer & more equable climate in the South of England.” Since the girl was living at that time in the St Barnabas’ Home For Girls, New Brighton, Cheshire – a place right by the sea – we can say that sea air on its own was not seen as especially important for health. Similar thinking appears in another case file. 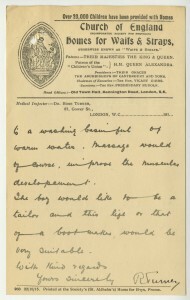 A doctor’s report from 1927 on a 16 year old boy, Leslie, who had been working at The Children’s Society’s head office in London, states that he is “obviously predisposed to tuberculosis, especially as he works in London”, and recommends for him “an outdoor occupation, preferably in the country or at sea, as this will probably prevent any active tuberculosis developing”. 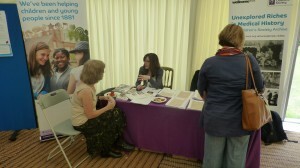 The Society helped Leslie find work as a steward on the SS Baltic. This was quite different to the career previously envisaged for him: earlier correspondence highlights Leslie’s aptitude for draughtsmanship. This case, like the others, shows the impact contemporary medical opinion had on the lives of children who had tuberculosis or were at risk of contracting it. Nowadays the condition can be treated with antibiotics. But a century ago the dangers were much greater, and the response was often to move children long distances for the good of their health, even if they were only considered susceptible to tuberculosis. At a time when urban air pollution in Britain was severe, sea air was valued for its quality. However, simply being by the coast was not essential: the objective was fresh air. 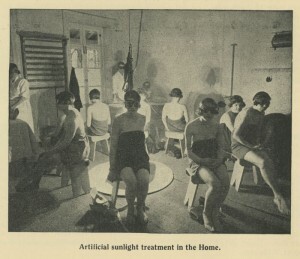 But the convalescent homes established on the coast did offer other benefits besides sea air. 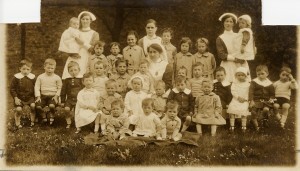 The staff were better trained to look after children with health problems. There were opportunities for the children to get exercise, which may have been limited in more urban homes. There is also evidence in some case files that children were given more or better food to build them up while they were staying in the convalescent homes. Finally, a modern study has suggested that there may be health benefits to be gained from living on the coast, but they are psychological ones, and not related to the air there. The case files show that, in the absence of today’s more effective treatments, a proactive approach to tuberculosis was taken, and this surely saved many lives. Click here to read another blog post on sea air and health, featuring a case where the avoidance of sea air was recommended. 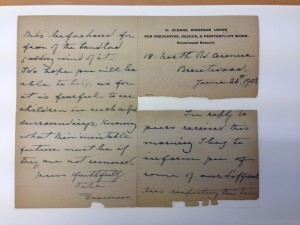 Here at The Children’s Society Archive we have eight volunteers, and they’ve been a great help in the Unexplored Riches in Medical History project and with other projects at the archive. The time the volunteers give really helps to enrich what we do, so we’re always looking for ways to say thank you. 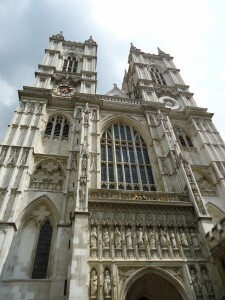 This week, as one way of saying thank you, we took the volunteers on a trip to the archives at Westminster Abbey. The Keeper of the Muniments at the Abbey, Matthew Payne, gave us an excellent tour of the library and archives, telling us about their history and the history of the Abbey. We heard that the library was originally kept in the Abbey cloisters, although most of those early books were dispersed at the dissolution of the monasteries in the 16th Century. The archives and ‘muniments’, however, have been kept intact, with some of them, and the chests they were stored in, dating back to the earliest days of the Abbey, nearly 1000 years ago. Most of the archives document the work of the Abbey, including records of the work of the monks that used to live at the Abbey, and records of the property and land that the Abbey used to own. 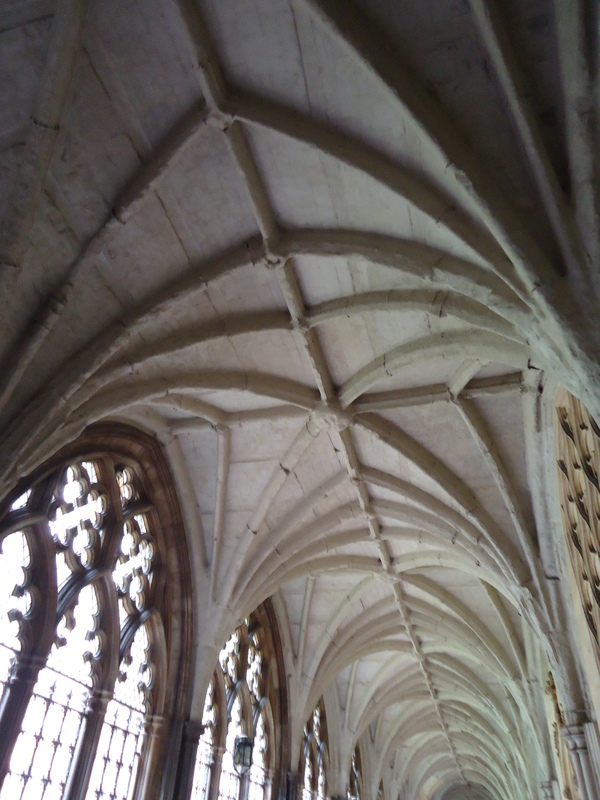 As well as getting to see some of the documents, highlights of the trip included seeing architectural features of the Abbey buildings, particularly in the muniment room. We saw heraldic floor tiles from the 13th Century, ornate, painted ceiling bosses, and a large mural of a white hart, dating back to the time of Richard II. All in all it was a fascinating afternoon. 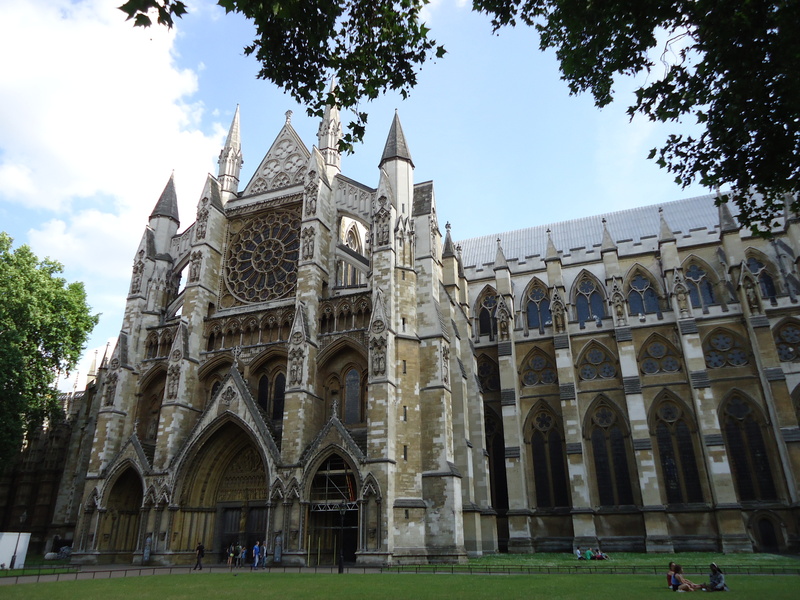 Many thanks to Matthew and to Westminster Abbey for allowing us to visit and, of course, many thanks to our volunteers for everything they do. More information about Westminster Abbey Library and Muniment Room can be found here. More information about the history of Westminster Abbey can be found here.